1. Launch the vSphere client. 2. From the Home screen, select Networking. 3. 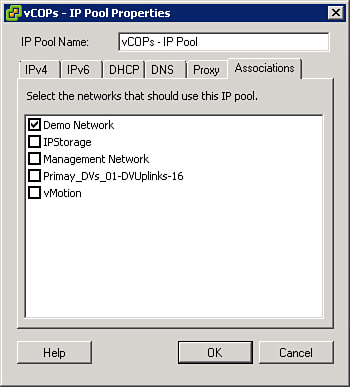 From the left pane, ensure you have selected your datacenter, and on the right, select the IP Pools tab (see Figure 2). Figure 2. 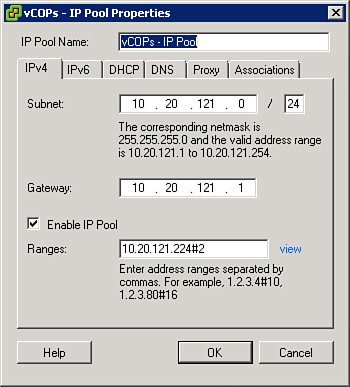 Configure an IP pool. 4. Click Add to add an IP pool configuration. 5. Provide a name and configure a set of IP addresses. There are various ways to do this; you can use a restrictive subnet mask to provide only the number of IPs required. In the case of vCenter Operations, you need one for Analytics and UI virtual appliances, so you can use /30 to provide two IPs, as shown in Figure 3. The interface accepts the mask in Classless Inter Domain Routing (CIDR) format and then translates it to a subnet mask, which requires the slash (/) and prefix number. Figure 3. Specify the mask in CIDR format (/30). The other method of specifying IPs is to use a smaller subnet mask and provide a range of IP addresses. In this case, you may use a 24-bit subnet mask and enter a range such as 10.0.1.20#2, for example. You can configure IPv6 addresses or tell the pool to actually use an existing DHCP service under the DHCP tab. DNS name servers, domains, and search prefixes can be configured under the DNS tab. If you are using an HTTP proxy, you can specify it under the Proxy tab. 6. After you configure the details for the networking attributes, you can associate the IP pool to a certain port group to enable the use of the addresses, as shown in Figure 4. After making the association, click OK to enable the pool. Figure 4. Associate the IP pool to the port group.